"It's a sigh of relief, monsoon marks are disappeared, sky is getting clear, definitely day time temperatures are comfortable and nights are getting cooler here ", said dad when I called him last time. Where my loved ones are in India, they don't face very harsh winter, but certainly their winter temperatures are enough to give them a experience of chilled weather ! While Indian markets or bazaars floods with abundance fresh fruits, vegetables and various type of dried fruits , nuts and spices, especially lush green various type of greens and so many colourful and fresh produces attracts you to the market. In India it's a perfect time to indulge in cooking and eating during this time. I clearly remember, holding mums hand going through vegetable markets, where cows, dogs, cats and goats are roaming around freely, it's a delight visual now but that time it was little discomforting for me, I love animals, but not comfortable being around them, vendors standing near their stalls or cart filled with piles of fresh produce, their amicability, price and good quality produce convince you to buy from them, and you see ladies haggling over the prices, seems "Bargaining" is their birth right;) and try to get fresh and good quality stuff as possible. I would patiently and happily tag along with Mum as I always like food and markets hustle and bustle. In those days even if you don't enjoy still your mum or older ladies of the family would insist that girls should get few tips on how to buy your groceries. Mum was fussy about buying fresh and good quality green leafy vegetables, was always searching in markets for this, when she found what she was looking for she was always pleased ! each fruit and veg had it's turn, I follow the same principals and enjoy rotating to variety. During the cold spell she used to make sure that METHI RINGNA was on the menu as these cooked with right spices can give you a bucket full of health benefits. Availability is bit scarce in the UK during the hard winter, where as in India it's the opposite ie more available in winter. But I make most of it during the summer months as that's when methi and ringna are largely available. So for me to post this recipe around this time is perfect right now :) I have cooked and devoured this sabji many times this summer. 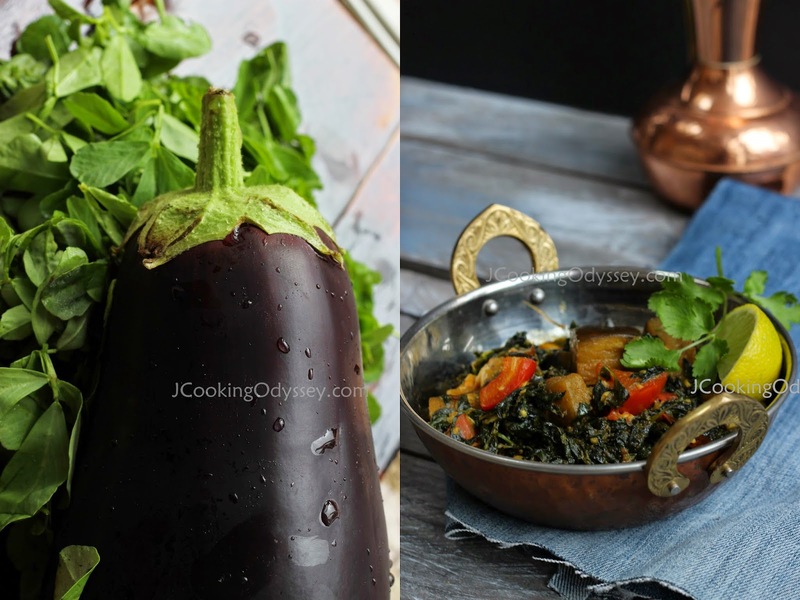 Methi translate fenugreek leaves and Ringna or Baigan translates aubergine, perfect match made in heaven, complements each other so beautifully. While classic winter sabji aloo methi so popular in north region of India, Methi Baigan gets a hearty welcome in most of the Gujaertai households. Cook with just few spices, this garlicky and spicy sabji is a perfect accompaniment to Bajri na Rotla ( Finger millet flour roti ) and Garlic Chutney, however normal roti or paratha will do. Heat oil in a kadai or thick bottomed pan. Add dried red chillies and ginger garlic and green chilli. After 13-14 seconds add hing, methi leaves and aubergine. Keep heat on high and thoroughly mix everything. Turn the heat low, cover the kadai with lid and cook the sabji for 5-7 minutes. Remove the lid, once mix and cover again. Now add all the masala, salt and tomatoes. Once again cover with lid and cook the sabji 3-4 minutes more. Add kasoori methi and cook another 1 minute. add lemon juice. Turn the heat off and serve hot. Hi, I just love your blog & recipes! Thank you for visiting and liking this recipe. I am afraid dried methi won't work this recipe, if you use it I am not sure you'll get same taste as fresh, however you can use fresh spinach with aubergine ( I make so many times, will post recipe sometime ) with adding little bit of dried mathi. Just a curious what about frozen methi ? availbale in Australia ?